This shrimp scampi recipe was inspired by a dish I ordered in a restaurant and is great served either as an appetizer or side dish. 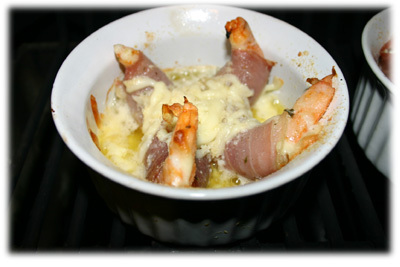 The shrimp are stuffed with cream cheese and wrapped in thin prosciutto then placed in a small oven-proof dish and drizzled with melted garlic butter and shredded cheese before cooking on your BBQ or in the oven. If you want the cheese to brown quickly on top then put the dishes on an cookie sheet and place under the broiler for 2 minutes before serving. Nice and easy scampi recipe that's as good as a restaurant and a whole lot cheaper! 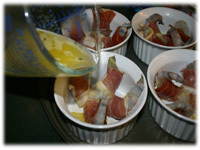 4 small ramekins or small short oven-proof bowls. Tip: If you don't have lemon pepper dry some lemon zest on a cookie sheet in the oven then mix with ground black pepper. Scoop approx. 1/2 cup Philadelphia cream cheese from it's package into a separate dish. 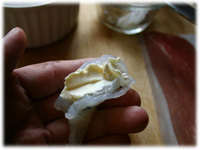 Select 1 raw, deveined shrimp and ensure it's back is open enough to hold cream cheese. With a teaspoon scoop some cream cheese and place in the open crack of the shrimp. 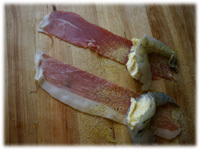 Cut a slice of prosciutto in half length-wise so it's just slightly narrower then the shrimp. 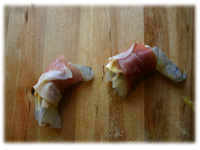 Place the cheese filled shrimp scampi at one end of the prosciutto. Sprinkle a little garlic powder and lemon pepper over top. 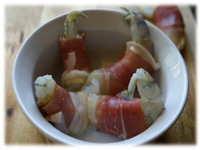 Carefully roll up the shrimp and prosciutto. 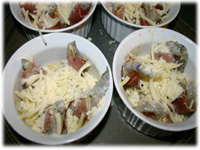 Place 4 rolled up scampi in the small oven-proof dish. Pour 1/8 cup (2 tablespoons) of melted garlic butter over the 4 shrimp. 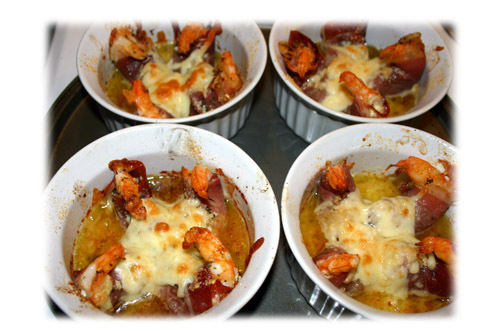 Sprinkle 1/2 tablespoon garlic powder over the shrimp and cover with 1/4 cup grated cheese. 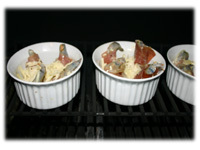 Place the oven-proof ramekins or small bowls on the top warming rack of the BBQ or on a cookie sheet on main grate. After 10 minutes lift the lid to make sure the shrimp are turning pink and the cheese is melting. When cheese is melted and bubbling and shrimp are cooked remove from the BBQ. If you want the cheese browned on top of this delicious recipe then place the bowls on a cookie sheet under your oven broiler at 500F for 2 minutes.